A heroic and fascinating biography of John Cage showing how his work, and that of countless American artists, was transformed by Zen Buddhism ("The New York Times")"
Where the Heart Beats "is the story of the tremendous changes sweeping through American culture following the Second World War, a time when the arts in America broke away from centuries of tradition and reinvented themselves. Painters converted their canvases into arenas for action and gesture, dancers embraced pure movement over narrative, performance artists staged happenings in which anything could happen, poets wrote words determined by chance. In this tumultuous period, a composer of experimental music began a spiritual quest to know himself better. His earnest inquiry touched thousands of lives and created controversies that are ongoing. He devised unique concerts consisting of notes chosen by chance, randomly tuned radios, and silence in the service of his absolute conviction that art and life are one inseparable truth, a seamless web of creation divided only by illusory thoughts. What empowered John Cage to compose his incredible music and what allowed him to inspire tremendous transformations in the lives of his fellow artists was Cage's improbable conversion to Zen Buddhism. This is the story of how Zen saved Cage from himself. 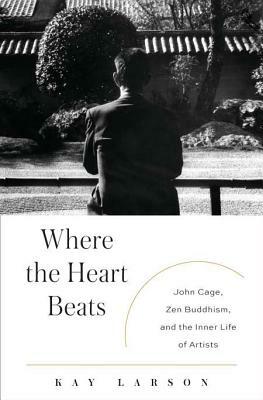 Where the Heart Beats" is the first book to address the phenomenal importance of Zen Buddhism to John Cage's life and to the artistic avant-garde of the 1950s and 1960s. Zen's power to transform Cage's troubled mind by showing him his own enlightened nature liberated Cage from an acute personal crisis that threatened everything he most deeply cared abouthis life, his music, and his relationship with his life partner, Merce Cunningham. Caught in a society that rejected his art, his politics, and his sexual orientation, Cage was transformed by Zen from an overlooked and marginal musician into the absolute epicenter of the avant-garde. Using Cage's life as a starting point, "Where the Heart Beats "looks beyond to the individuals Cage influenced and the art he inspired. His creative genius touched Robert Rauschenberg, Jasper Johns, Andy Warhol, Yoko Ono, Alan Kaprow, Morton Feldman, and Leo Castelli, who all went on to revolutionize their respective disciplines. As Cage's story progresses, as his collaborators trajectories unfurl, "Where the Heart Beats" shows the blossoming of Zen in the very heart of American culture. An acclaimed art critic, columnist, and editor, KAYLARSON began her career in journalism in Cambridge, Massachusetts, at "The Real Paper," then served as an associate editor at "ARTnews" and an art critic for the "Village Voice." She was the art critic for "New York" magazine for fourteen years, and has been a frequent contributor to the "New York Times." In 1994, she entered Zen practice at a Buddhist monastery in upstate New York. Though Larson has written for many types of publications, "Where the Heart Beats" is her first book."